The Doctor takes Clara back in time to Las Vegas, 1983 - or so he thought, as the TARDIS lands them on the stricken Nuclear submarine Firebird. But the Russian crew have found something, buried beneath the Arctic Ice... an old foe that The Doctor is more than familiar with. Spoilers, of course, beyond the cut! Let's get the big thing out of the way at the start: Cold War is easily the best script Mark Gatiss has written for Doctor Who since The Unquiet Dead. It lacked the pacing problems that plagued Victory of the Daleks and Night Terrors, and it had the creepiness factor that The Idiot's Lantern tried to ape with its Faceless people but ultimately failed to deliver on. I think the only bit that might be contentious was the relatively quick wrap up of events, but unlike, say, the sloppy ending to Gatiss' own Victory of the Daleks, or even last week's The Rings of Akhaten, this one made sense in the story: even if it was a bit convenient for Skaldak's Ice Warrior buddies to show up and save everyone from Mutually Asssssssssssssured Dessssstruction, it showed us that the Ice Warriors can be honorable, merciful creatures. 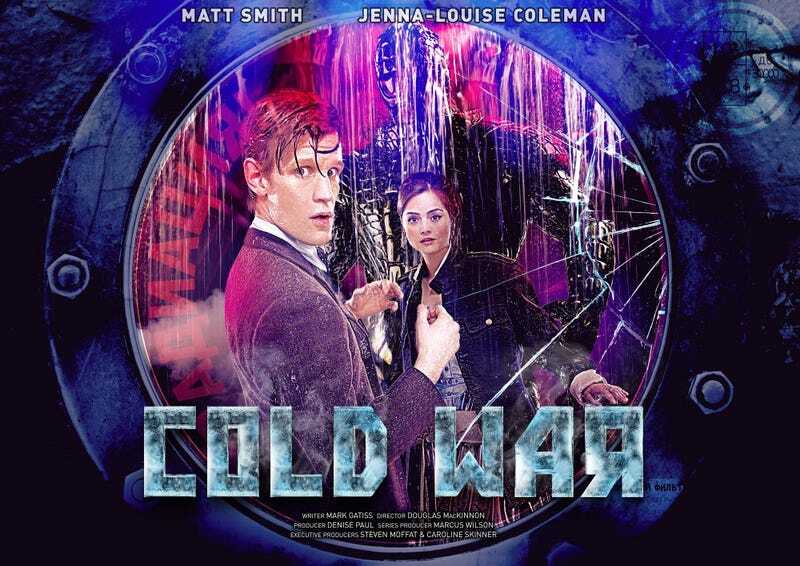 It's almost a shame it wasn't broadcast late last year - Cold War is like a comforting, Classic-Who blanket on a cold and rainy winter's night. And my word, what a wonderful blanket it is! The tension, the pacing, the camerawork, the lighting, the acting (although he was lovely, David Warner's Professor Grishenko was a tad underused)... that was Doctor Who firing on all cylinders. It had humour, heart, some jolly good action, and tension by the bucketloads. I don't think I've ever been so on edge during an episode of Doctor Who in my entire life! And Skaldak was a perfect, horrific, threat - you didn't need to show the violence to emphasis that. A grab, a scream, an out of focus scratched up hand, a spot of blood... and yet still immensely petrifying. I want to go back and watch that in the dark, to make it even creepier. I mean, just look at that. The lighting, the framing, the way Skaldak's breath is crystalising the air around him... if you could marry a camera setup, I'd marry this one. Let's talk about Skaldak a bit, actually - because this was a triumphant return for our Martian friends. There was all the elements of the classic monster - the sonic blaster, the hiss, Millennium FX's glorious suit, the fact that Ice Warriors aren't the one-note bad guy and the fact that they can be allies, can be merciful and honorable - and yet something new in the decidedly chilling out-of-armor moments. Easily the greatest update NuWho has done for a classic monster since Dalek in 2005 - even if the face reveal didn't quite work for me. The CGI was decently done, but I didn't much care for the design of it. It didn't seem to fit with the prosthetic claws we'd seen terrorising the sub for the past 40 minutes, and it oddly reminded me of the Kudlak from The Sarah Jane Adventures in a way. My least-liked aspect of the episode, but easily forgivable considering the stellar production value of the rest of it. Once again, Jenna-Louise Coleman has come into her own as Clara. She really upped her game in this one, showing Clara's independence as well as her wholly human passion and courage as she faced down Skaldak. I'm really excited to see Hide next week actually, as it was the first she shot, but three episodes in and JLC has made an incredibly impressive first impression. Although, moment of speculation - was The Doctor testing her, manipulating her? He told her she couldn't be the one to parlay with Skaldak, and made a big fuss of not wanting her to do it, but then she did it anyway. As a one off, that would've just been a moment to highlight the companion's spunkiness, their willingness to get things done - but then later on, as Grishenko and Clara comment on a bit of Hungry Like The Wolf, and The Doctor tells Clara to stay put, there's another moment. When she says yes, the camera stays on The Doctor, and he looks... surprised at her answer? Confused? It was like The Doctor was testing her just to hear her reactions, despite him telling her otherwise that it wasn't a test. It might not be important, but to me, it subtly felt like The Doctor was trying to push her, to test her and figure her out. That might be a moment to watch out for in the next few weeks as we unwrap layers of Clara's mystery. But yes, overall, an absolute cracker of an episode. Downright gorgeous, downright scary... and downright Doctor Who. Can we have the Ice Warriors back in force, sharpish? I need to see more!